Despite previous reports to the contrary, Apple’s next-generation iPhone will have near field communication (NFC) mobile-payment technology — which basically turns a cell phone into a credit card — built-in, according to Forbes. Of course, the rumor comes via a second-hand source, who remains unnamed — and we all know how that kind of news can go, especially when Apple’s involved. This information contradicts a March 14 report from The Independent, which indicated that Apple had met with various wireless providers in the UK, and told them that the iPhone 5 will not include NFC technology because of “the lack of a clear standard across the industry,” according to an anonymous source. The news surprised industry watchers, as three carriers in the US — T-Mobile, Verizon and AT&T — have all signed on to the Isis NFC standard months ago, which more or less negates the alleged reasoning behind Apple’s abandonment of NFC. Google — Apple’s fiercest competitor — has already included NFC technology in its Android operating system, and is available on a number of devices. In addition, Google reportedly plans to launch its own limited NFC system, along with partner VeriFone Systems, in New York and San Francisco. Research In Motion has said that it plans to release NFC-enabled BlackBerry devices as soon as possible. 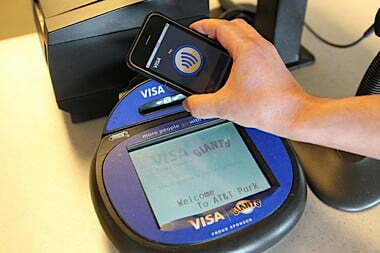 As always, Apple’s NFC plans are still in the stage of speculation. But with talk of it percolating up from those in the industry, it’s at least safe to assume that Cupertino is at least considering bringing NFC to the iPhone 5. Whether or not it will show up in the final project (expected for a June reveal) is another thing entirely.